Hi Susan, it was our first time in Northumberland. My wife and I stayed in Alnwick for a couple of days and did the touristy things such as Holy Island, Bamburgh Castle, Alnwick Castle and visited a couple of places along the coast like Alnmouth and Warkworth. We were really impressed with the area and intend to return soon. I must be honest, I only wear my plastic mac when it's raining and just carry it if the rain stops. I love your photos on Flickr and other sites such as pinterest and I have read your comments on Rainwear Central. I think it's very clever how you incorporate your photos into Pakamac adverts and magazine covers, you are obviously very good at Photo-shop. Well done. You may have seen some photos of my macs and other rainwear photos on Flickr, my user name is Taffmac. Hello G, I live about 20 miles from Talgarth; I'm a "Valley boy". In fact, I drove through Talgarth yesterday on my way to Hay-on-Wye. It was very warm and sunny yesterday but I have worn my see-through plastic mac in Talgarth in the past when it has rained. On a few of the occasions when I have worn my plastic mac on holidays my wife and I have been accompanied by two of our friends. Imagine my surprise when he texted me yesterday to say that he had ordered, and received, a couple of GO travel unisex plastic macs for him and his wife for a holiday in Scotland in a couple of weeks. So you see, it's up to us enthusiasts to wear our macs and encourage others to wear them too. Thank you for the mention Jeff, in your post. What a pity I missed seeing you in your plastic mac, when you visited Northumberland. It could have been likely that you would have seen me in one of my macs, most likely a navy blue nylon mac (Rainstar or YB Wet, not Pakamac). Northumberland is a big county though. I go out wearing macs whether it's raining or not. How about you Jeff? It's a real shame I don't have any macs from the Pakamac label in my collection. Nor am I likely to either, given the frenzy of bidding when one of a suitable size appears on eBay. I love it, though, that my image appears so many times in a Google image search for the word 'pakamac'. I've seen photos of Bev, G and of course Brian, before. Does anyone else have photos 'out there'? Despite the lack of Pakamacs in my collection, I was surprised to see I still have a YB Wet nylon mac in it's bag and with tags attached. There's a photo on my Flickr pages. my see-through plastic mac or jacket when on holidays, Blackpool, Edinburgh, North Yorks Moors Railway, Derbyshire, Northumberland, Llangollen, Scilly Isles, Stratford-on Avon and many more places. Only a couple of weeks ago I could be seen walking in the rain near Abergavenny (not far from where I live) wearing my see-through plastic mac. Rob described Beth's mac as "transparent but not completely, if that makes sense". Of course it makes sense, Rob. It could also be described as semi-see-through or translucent (a term used to describe plastic macs in the mail order catalogues of the 1950's). I hope that Rob, G, Susan and others continue to leave comments on this site as I, for one, find them very interesting. Hi G we are going to Wales so if we have any rain this week I will definitely put another comment on here. I was wearing one of my Airforce Blue nylon Pakamac style macs on Friday when I was shopping in a Morrisons supermarket, where the checkout lady said how much she would like a mac like that. It made me think that if there were more ladies like that, traditional nylon macs would still be available. We had only a shortish conversation about macs and that I was always in that branch wearing one of my many macs. Which is true because it rains regularly in Berwick and I always have a nylon mac on or sometimes a plastic mac. Whilst I do enjoy leaving comments on this site l find it difficult to have any direct conversation with anyone because of other comments about other things are entwined. What is it about a plastic mackintosh, like alan i was first drawn to plastic macs at about 11. loved to see the girls wearing their macs. longed for wet summer days so could see them. shame they are all but gone. What do i get out of wearing my mackintosh can't explain . Just know when i have got my plastic or nylon mackintosh on just do not want to take it off. Hi Rob yes fantastic comments has the shop a web site not many shops sell plastic Mac's love to visit the shop did you find it by luck or do you know about it give my regards to Beth. Hello Alan, I fully agree, and understand, everything you have said, for I too was in eactly the same situation, so wanting one of those soft smooth filmy grey Pakamacs, and like yourself, there were many around at that time. But more luckily, I actually persuaded my parents to get me one, and I just loved wearing it, thinking nothing of the jeers I sometimes got from other boys, calling me Pakamac. I still have some, and will never part with them, So please don't think you are alone in this, thare are others about who would truly like to see this site return to what it was initially entended to be. Thank you for reminding us all of that, Stephen. Just been reading some of the old comments left here on this Pakamac site. l along with several others are there making our comments when the site first became available in 2007 where have those ten years gone. The site was here for comments on the Original Pakamacs which were as most of you know Plastic. l was around 11 years old when l first got the chance to try one on. l was drawn to them and not really sure why, l was at school this particular wet day and Pakamacs were very very popular and the cloakroom was filled with them. L ask to leave the lesson for toilet. making straight for the cloakroom l made sure no one was about and l slipped a pakamac of the hook and put it on me and fastened it up. The effect was unbelievable and at that age found it difficult to understand the feeling l got. coming from a poor family l dare not ask for one so l waited and waited and noticed that someone had left a pakamac in the cloakroom and it had stayed there for weeks and weeks. l eventually decided that no one wanted or needed it so l took it home that afternoon. l walked the back way home through the fields and by the allotments it was very secluded so out came this mac and l slipped lt on again and the effect was the same again. The reason l write this is because 1200 or so comments no one has actually said what the real effect of wearing plastic pakamacs is, has you all guessed from my story my first sexual experience was induced by wearing a plastic pakamac. l would love to hear others experiences in plastic pakamacs, after all that is what this site was all about. I think it probably depends where you are G. I think I read somewhere that it has been quite wet in some places. We have just come back from Scotland and one day it was lovely and the next day it was raining. The day we went to culean castle it absolutely bucketed down and it rained when we went to logan garden last week. Is it possible that the demise of the nylon pakamac is related to the gradual passing of a generation rather than a changing of tastes in fashion? There simply weren't enough of us left to keep it viable. This forum is our last refuge, along with our dwindling collections. I only say this having been party to many a conversation with older ladies in the past, over a shop rail of nylon macs. As I am in my 60s now, many of these ladies I guess, will have passed on. Not really G but we have had quite a lot of practice trying to put on plastic macs and not get wet getting out of the car in the rain. I can think of lots of times we have had to do that and I think we are quite good at it now! It is not very easy to stay dry so perhaps this is why some people just run for it. Just in the north east of Scotland G, but that was around 9 years ago, in shops that have now sadly closed. I preferred to look in places that would cater for passing visitors rather than locals. People passing through who might just need the protection of a 'cheaper' mac when the weather caught them out. Hi Susan yes I wear a mac myself when driving just wondering if you have come across a stock of pac a macs when driving about? Well I personally wear a mac while I'm driving, whether it's a plastic mac or a nylon mac. It's always a trat to be driving somewhere new in the vain hope that I'll find some undiscovered backwater that still has a stock of Pakamacs! yes I'm sure that's right and many shops are also covered now so perhaps there is not quite the same demand for them. A lot of people have asked us where we got ours so I still think it is partly because you can't buy them in the shops. That's the thing I don't really understand. My wife says if you fold them carefully you can get them smaller to take on days out. Hi Rob I remember buying a nylon mac from Army and Navy stores the young lady assistant folded it up so expertly I could never fold them like that I think some ladies use to roll plastic macs up. sadly there is nothing like that these days. Sorry I meant I can't really understand why they stopped making them. We've had lots of people ask us where we bought ours. Yes I know what you mean. I think there is a special way because my wife can fold them up really small. Because they fold up easily is why I think people really like them. You can take them anywhere and put them on when it rains. Which is usually does! As I said I can really understand why they stopped making them. I agree G they might not be fashionable but they are really practical and its nice not to have to worry that it might rain if you are out for the day which is what usually happens to us! I'm not sure about other countries G. The furthest east we've been is Norfolk and the weather was really nice there! I haven't really thought about plastic macs being in fashion. I don't think ours are! But then you don't worry so much when its pouring down and you just want to stay dry but maybe thats just us and our age! I don't know if it helps but I think ladies wear macs just to stay dry and plastic macs because they fold up easily and you can take them with you when the weather is changeable, at least that's my wife anyway! I think the reason you don't see people wearing them so much now is because it's really hard to find them in the shops and not because people don't want to buy them. 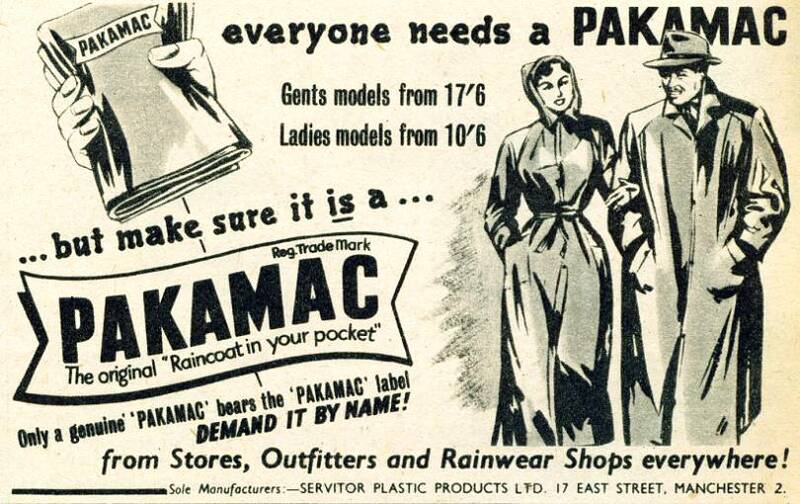 I'm really surprised no-one has started making packamacs again because I'm sure they would still be popular.